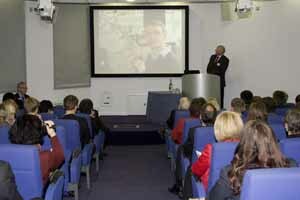 The Arkwright Scholarships Trust has made its 2012 award of Scholarships for aspiring leaders in engineering. 335 Scholarships for school students and 4 Undergraduate Scholarships were awarded – the largest ever annual number. Scholars received their awards at a prestigious Ceremony hosted by The Institution of Engineering and Technology in Glasgow on 2nd November. A further ceremony was also held in London. The Scholarships were awarded to the new Scholars in Glasgow by Professor Peter Grant OBE, Emeritus Regius Professor of Engineering at the University of Edinburgh. The Engineering Scholarships support students through their Higher/Advanced Higher studies and encourage them into top universities and apprenticeship schemes. Scholars are selected following a rigorous process comprising: an assessed application form with teacher’s reference; a two-hour aptitude exam; and a university-based interview. Arkwright Engineering Scholarships consist of an annual financial award to the Scholar and to his/her school, and a range of enrichment activities, such as mentoring and industry visits, that enhance a Scholar's experience of engineering in a real-world context. The Scholarships are highly regarded by universities and industry and help to create a pipeline of top talent into the engineering profession. This year’s 335 school-age Scholars come from across the UK, from the west coast of Scotland to Jersey. 27% of the Scholars are female. Four undergraduate Scholarships were also awarded, generously supported by The Lloyd’s Register Educational Trust and The Reece Foundation. These Undergraduate Scholarships are valued at between £10,000 and £12,000 and are available each year exclusively to existing Engineering Scholars. The Scholarships are supported by an expanding group of companies, universities, Professional Institutions, Trade Associations, the Armed Services, Charitable Trusts and personal donors. Arkwright’s National Director, Dr Martin Thomas, commented: “Our Glasgow and London Awards Ceremonies represent the pinnacle of the Arkwright year. It has been fantastic to meet the new Scholars and to hear of their personal achievements. It has also been incredibly rewarding to see our Alumni return to the Awards Ceremony to demonstrate their successful industrial careers to the new Scholars. They are the proof that Arkwright has an impact on these young people’s lives”.